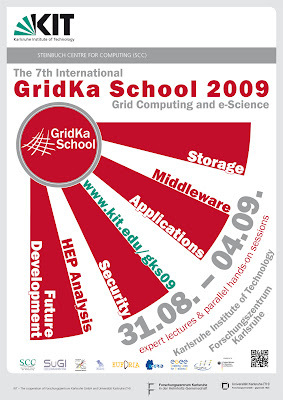 Established in 2003, the International GridKa School is one of the leading summer schools for grid computing and e-science. This year's event is scheduled for August 31 to September 4. This one-week summer school for grid computing and e-Science is arranged by the Steinbuch Centre for Computing (SCC) of the Karlsruhe Institute of Technology (KIT, the cooperation of Forschungszentrum Karlsruhe GmbH and Universitaet Karlsruhe), together with the project 'Enabling Grids for E-Science' (EGEE), the project "Sustainable Grid Infrastructure" (SuGI, which is part of the D-Grid initiative), and the HGF Alliance "Physics at the Terascale". GridKa School offers a broad range of topics, which are chosen from the realm of these projects and beyond, aimed at beginners, experienced users and grid administrators from science and industry. About 50% of the school consists of hands-on tutorials and workshops, giving participants the possibility to gain actual expertise on different kinds of middleware, applications and techniques. Because these tutorials are offered in parallel tracks, GridKa school practicals cover topics well suited for beginners, experienced users and grid administrators. The high grade talks and presentations give an up-to-date overview on important and interesting grid subjects. The program is completed by a 'get together' event (including a guided tour of the German WLCG Tier-1 center 'GridKa'), a school dinner, a poster session (students are encouraged to present their work) and a grid security workshop; the latter is targeted at administrators. Applicants from all scientific and industry disciplines are welcome to apply online at www.kit.edu/gks09; the full preliminary schedule is listed on this homepage. Before July 31st, registrants can take advantage of an early bird discount. The organizing team reserves the right to limit the number of participants, if necessary. Any questions? Contact GridKa-School@fzk.de or Dr. Christopher Jung, Karlsruhe Institute of Technology (KIT) Forschungszentrum Karlsruhe GmbH Steinbuch Centre for Computing (SCC) Tel: +49(0)7247 82-8606 Fax: +49(0)7247 82-4972 christopher.jung@kit.edu.